Royalty is not a common sight in lists of philosophers. Few clear examples come to mind immediately: Marcus Aurelius, princess Elisabeth of Bohemia – and Friedrich II of Prussia. Known by the title ”philosopher-king”, this enlightened despot appeared to have a golden touch. 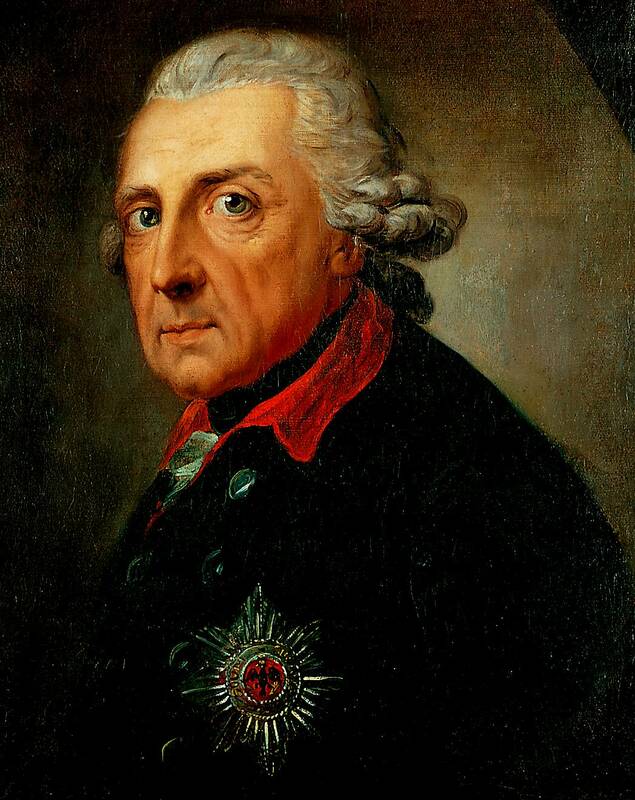 In his life time, Prussia rose from a slightly larger German territory into ranks of European superpowers, boomed economically and received a more modern system of justice. Furthermore, he strove to raise the status of Prussian culture to the level of French culture he loved and invited to his court many French litterateurs and philosophers, such as Voltaire. He even called back Christian Wolff, whom his father had long ago exiled because of suspicions of heresy. Despite the grand sound of all these efforts, it might well be asked what this person is doing on a blog concentrating expressly on philosophical writings. Well, Friedrich II did write – poetry, but also some more philosophical works. It is especially his L'Anti-Machiavel that will now be my topic. As the name of the book suggests, target of this critical work is Machiavelli and especially his most famous work, The Prince, famous for it utter immorality. In this work, Machiavelli had declared that a good prince should use all the means necessary to get to his ends – war, plunder, deception, murder, slander, you name it. Even if Machiavelli's advice appears rather cynical, he was in his heart a republican, and The Prince was merely an attempt to find a suitable local prince, who could use it for the honourable end of uniting Italy under a home-bred rule. Friedrich connects his own work with quite another philosophical debate – he considers Machiavelli to be even greater threat than Spinoza, because while latter had erred only in matters of speculation, the former wrote falsities in important practical matters. If Spinoza was commonly seen as gateway to atheism, Machiavelli led to even worse immoralism – to the idea that a ruler should not strive for the good of his people. While Friedrich's motives are clearly based on morality, his argumentation is not. Instead, he tries to show that a Machiavellian prince cannot even fulfill his own ends with the means of Machiavelli's book. A prince cannot really rule without the support of his citizens, as is witnessed by many revolutions against despised rulers, Friedrich notes. Deceptiveness and cruelty might help one in gaining kingship, but such qualities cannot be used for retaining one's rule. Furthermore, Friedrich notes that Machiavelli's The Prince does not take into consideration relativistic nature of cultures. In other words, methods of rule fit for 16th century Italy – a time of petty principalities fighting for equally petty reasons – do not work in other lands, let alone at other times. In 18th century, small principality just couldn't afford to e.g. wage war alone, but should accept alliances with other principalities. Next time, we'll move back to aesthetics.